When President Franklin D. Roosevelt signed Executive Order 9066 on February 19, 1942, he set in motion one of the most shameful chapters in American history: the incarceration in internment camps of over 120,000 Japanese-Americans for the duration of World War II. One family’s experience in being torn from the home they loved forms one of the major subjects of Jack Perla and Jessica Murphy Moo’s opera An American Dream, first performed by Seattle Opera in 2015 and brought to Chicago by Lyric Opera Unlimited. Set in the Kobayashi family’s home on Puget Sound, the overly ambitious piece covers the period 1942-1945 in a 75-minute chamber opera. 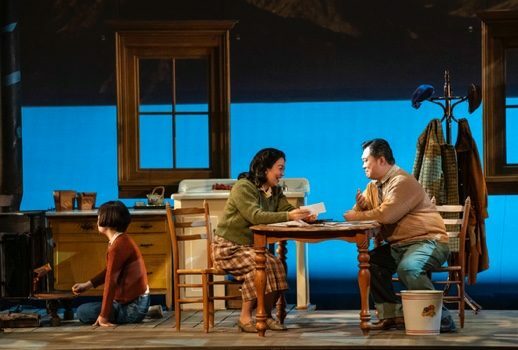 The opera begins with the family reading headlines about Japanese-American families being taken by the FBI, and trying to destroy all vestiges of their Japanese identity. Daughter Setsuko refuses to give up a treasured doll, and hides it under floorboards. Meanwhile American veteran Jim Crowley and his German Jewish wife Eva appear, Jim believing he can get the Kobayashis to sell their house to him for much less than it is worth. When the FBI, finding dynamite in the Kobayashi’s shed, comes for the father, in desperation he signs the document selling the house to Jim. After her mother dies in the camp, Setsuko returns to the house to confront Jim. Eva has found her doll and returns it to Setsuko, who gives her the letter that she had taken. Eva reads the letter and collapses—her parents had been shot and killed three years earlier. All these events are simply too big for a one-act opera. The work is at its best as a meditation on the nature of what “home” really means, and at its most moving as the Crowleys and the Koyabashis realize they can’t go home again. But covering the whole story of the internment camp with the addition of Holocaust references really needs at least one full length opera, if not two. Nevertheless, An American Dream tries nobly to illuminate these events in a deeply personal way, and the result is a touching and occasionally moving afternoon. Perla’s music is fluid, transparent, sometimes jazzy, and always intriguing under the incisive baton of conductor Daniella Candillari. Its best moment is in the overture, evoking the idyllic Puget Sound setting. At times, a certain sameness creeps in, but the music of the final confrontation scene between Jim and Setsuko powerfully underscores the high emotion of the scene. Ms. Moo’s libretto works well in dialogue, but floats into philosophical platitudes when the characters have moments of rumination. The singing is of a very high caliber. Nina Yoshida Nelsen, who has sung the role of Mama since its first performance in Seattle, gives a touching and heartfelt performance. Ao Li’s soft-grained bass-baritone provides a Makoto Kobayashi of depth and dignity. Christopher Magiera works hard to make something of the “ugly American” stereotype of the blustering Jim, and finds some success in the later moments of the piece. Catherine Martin as Eva has the largest voice of the cast and impresses with superb diction and depth of interpretation. But vocal honors go to the remarkable young singer So Young Park as the daughter Setsuko, using her shimmering soprano to move from childish innocence at the beginning to embittered fury after her experience in the camp. Her tirade against Jim in the final scene is harrowing, Setsuko repeating the phrase “Do you recognize me?” to powerful effect. I’d love to see the composer and librettist expand their ideas into a full-length opera that would allow for further plot and character development than the one-act form allows. It’s already serving an educational function—I learned a great deal that I didn’t know about the internment experience in the pre-show film that played in the lobby. But An American Dream gives us only hurried glimpses into this complex story.